Anna: Nanaimo Bars, where have you been all my life? Nanaimo Bar: Gosh, I’m in just about every single cookbook you own. Anna: But why didn’t I notice you? How could I have looked you over like that? Nanaimo: Anna, sometimes seeing “custard powder” or “pudding mix” in the filling puts people off, but I can’t help it. It’s what makes me, me. I can’t let it go. Anna: But Nanaimo, I love pudding. That’s no excuse. How can I ever forgive myself for the way I’ve treated you? Nanaimo: I don’t know, Anna. I don’t know (Nanaimo pauses to think). A bar cookie associated with Nanaimo Canada. A delicious bar cookie with a graham cracker base, creamy pudding filling and chocolate fudge topping. Preheat oven to 350 degrees F. Line a 9 inch square metal pan with nonstick foil or parchment paper. Stir together melted butter, sugar and cocoa powder. Stir in egg and vanilla, followed by coconut, nuts and graham cracker crumbs. Press crumb mixture tightly into pan and bake for 10 minutes. Let cool completely. Cream butter and 1 cup of the confectioners sugar with an electric mixer. Beat in vanilla and pudding mix. Stir in remaining confectioner's sugar and milk. Beat until fluffy. Spread over cooled bars and chill. Melt chocolate with butter (or whatever you are using). Pour over chilled bars. Return to refrigerator to set chocolate. 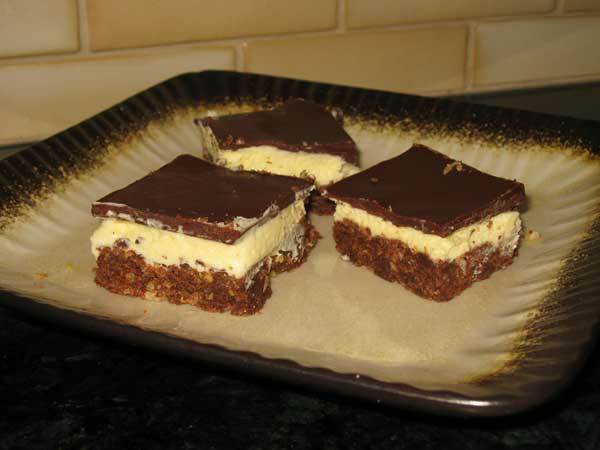 Nanaimo bars were a topic of discussion at my fitness center (stop laughing…ALL we talk about there is FOOD;-)) Anyway, I rec’d a recipe that using cream cheese rather than custard powder. These bars are worth making and awesome!!! You can freeze them too! My recipe did not use the coconut nor the custard powder or pudding mix. I know the authentic recipe does use both coconut and custard powder. Anna, love this post and looking forward to exploring your cookie recipes! Nanaimo is pronounced nah(as in “Ah! I see”)–neye–moeHope this helps. They look delicious, Anna.You can flavour the filling as well with your favourite flavour. For example, orange, mint, raspberry, mocha, coconut, etc. The traditional is by far my favourite though. Hi Anonymous! Thanks for the pronunciation key. Hopefully it will help Longhorngal and Todd when they take me to the mental hospital and explain that I was having conversations with nah-neye-moe bars.Before that fateful day, I’m definitely going to try some other flavors, and I want to try making them with Byrd’s Custard Powder for more authencity — though the Jell-O pudding mix is quite tasty.In fact, now that I’ve had the authentic version, I think I’d like to try these with a brownie base. The Barefoot Contessa’s Outragrous Brownie recipe combined with Nanaimo filling and chocolate topping. Ok, time to put the mixer down and back away slowly. Food does NOT converse. :DUnless of course these are “special” Nanaimo bars…Did the bars tell you how to pronounce Nanaimo? you’ve inspired me… i may try these sooner than later.